With quiet, understated passion founded on an encyclopaedic knowledge of Gandhi’s writings and the workings of the Indian state, the authors examine the 73rd and 74th Constitutional Amendments to argue for three highly significant points. The first is that Gandhi had a clear and articulated political philosophy leading to a political economy; the second is that the design of the Indian state, including sections of the relevant Amendments, is part of the problem; the third is that local government is central to the Indian state and Indian society as a whole. Starting with Gandhi’s attitude to the state, the authors move through a history of decentralised democracy in India until and after Independence to a critical evaluation of Panchayati Raj, with a case-study of Karnataka and an analysis of urban local governance under the 74th Amendment; they conclude with a range of incisive reflections. The opening argument is that Gandhi, despite saying the state is a ‘soulless machine’ representing violence in a ‘concentrated and organised form’, was never a totally anarchistic advocate of a stateless society. He accepted the fact of human imperfections, and he did not expect the full realisation of his ideal of little republics — Gram Sabhas — federating themselves to create the state by what he considered genuine home rule through individual restraint and self-control. For Gandhi therefore, state power had to be kept in check, and he envisioned not a pyramidal state but one with institutions organised in concentric circles. Local self-rule would be at the centre, and the state would be a trustee, not a centralised ruling body. This went with a clear sense of the interdependence between the polity, the economy, and society; the informing principle was sarvodaya through equality in opportunities, rights, duties, and moral responsibilities. Technology would adapt to human needs and not take control of our lives; this also makes Swadeshi into self-reliance through production by the masses, not mass production. Serious opposition to this came from Jawaharlal Nehru and Bhimrao Ambedkar, who respectively considered a conventional state essential for stability and progress into modernity; they saw a centralised state as the only institution which could overcome the bitter stratifications of Indian society. The conventional idea prevailed, but at least in principle the Indian state has taken local government seriously. From Independence until 1992, the year the 73rd and 74th amendments were passed, Parliament passed 47 Acts and Regulations pertaining to local government, mainly for specified states; the book’s Annexure I gives an invaluable table of those measures, summarising each one and stating the respective roles of the State and the bureaucracy. The authors, nevertheless, show how India’s partially unaltered colonial institutions and the belated constitutional entrenchment of local self-government have created a bewildering plethora of overlapping procedures, systems, powers, and responsibilities. For example, the 73rd and 74th Amendments give States the legislative power for their implementation, with inevitably varied results whether in rural or urban areas. The crucial question is that of the powers States will delegate to panchayats, including those in Scheduled Areas. Under the Eleventh Schedule to Article 243G of the Constitution, States can thus delegate no fewer than 29 subjects, including agriculture, land reforms, roads and electrification, school and technical education, health and sanitation, and mining leases. The authors analyse several development indicators closely, concluding that despite decentralisation, development is not reaching the rural poor in absolute or relative terms. Where there are genuine local improvements, however, one key reason is women’s participation. Despite pervasive patriarchy, women have seen political participation — even in a non-partisan form — as the route to development; their terms in panchayat office have been more transparent, less corrupt and authoritarian than those of the men, and notably more effective in improving health, education, and basic services. Similar results obtain for Dalit panchayat members, but women and Dalits face immense obstacles; the mandatory rotation of Chairwomen has restricted women’s participation, and has accompanied their reduction to proxies for male relatives. 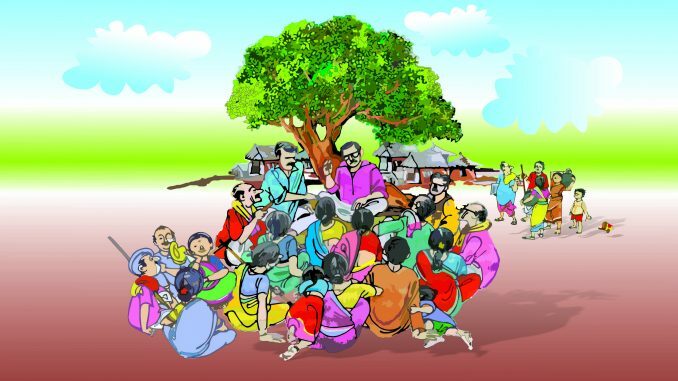 Corresponding problems occur for male members from reserved categories, and the caste system generates enormous barriers — though the presence of sarpanches from scheduled castes is bringing about local changes, even by creating perceptions that caste-related behaviour is changing. The authors’ conclusions go beyond their initial suggestion that State Legislative Councils and other higher tiers of governance include members elected from panchayats. They are very clear that local self-governance enables political education and strengthens civic consciousness, in addition to improving transparency and accountability. This, of course, requires far greater provision of funding as well as designated and clear powers to use that funding; such reforms would at least go some way towards realising Gandhi’s vision. This book is both a powerful argument for an undervalued area of Gandhi’s thinking and a treasure-trove of examples, which show how India’s system of state works — or fails to work.